Welcome To Love's Labradors Retrievers! I breed AKC and HRC Labrador Retriever puppies and as well, offer stud service in yellow, chocolate and black colors. The goal of Love's Labradors is to produce genetically clean health tested labrador puppies that are superior in good looks, intelligent puppies that have a strong keen sense of smell for the bird, antler sheds, cancer, have strong desire to retrieve, have a built that is structurally sound and balanced, be agile and quick to handle any agility event, flyball or dock dog jumping, have a wonderful disposition that are cuddly, warm and have a sensitive temperment that makes the best family companions at home, RV or traveling. I breed Labrador Retriever puppies that are 100% birdy in the field by age 6 months with a bird desire and willingness to learn by your methods and not be on their own agenda. By producing Labrador Retriever puppies that are American Field plus some lines have half English or British, Scottish or Irish lines in there to help balance the steadiness out in the field as your hunting partner or at home with a level head. Love's Labradors believes in the original look of the Labrador 100 years ago with a nice blocky square head, balance structure to the body, otter tails along with natural hunting instincts that also makes it easy enough for an average person to train. Love's Labradors believes in performing proper testing that science has made available so as to insure you and the Labrador Retriever puppy best possible health to date. Hips and Elbows are OFA certified. Eyes have annual eye clearances along with regular eye refractory to check on any near sightedness development. DNA tested thru Optigen, Paw Print Genetics and Vet DNA Center the following: EIC (Exercise Induced Collapse), CNM (Canine Myopathy), DM (Degenerative Myopathy), PRA-PRCD (Progessive Retinal Atrophy), RDOSD (Retinal Dysplasia and Ocular Skeletal Dwarfism). And we check the heart for any murmors or abnormalities. Love's Labradors leads the campaign throughout the United States in regards to educating and redirecting breeders to do proper testing where they fall short of. 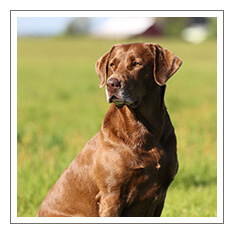 Love's Labradors competes with both the females and the stud labradors to test their soundness, birdiness,steadiness and overall test of time to waterfowl hunting, upland hunting in both flushing and pointing competitions with AKC, HRC and APLA. Love's Labradors puppies are whelped at home within a few steps from the bed. I find that the personal and constant touch 24/7 helps insure a stable and well socialized labrador retriever puppy coming home with you. At the time of the puppy deposit agreement \ is agreed upon this includes the 30 month guarantee for all the above testing listed. I email a labrador retriever puppy health form that states the home preparations needed for your new puppy, the need for above board cleanliness and sanitation, shots and worming schedule for both puppies and Mom to take in with you to your Vet at first puppy visit which I recommend within 72 hours in getting home. I follow-up after the puppy is home with you to make certain all is going perfect and to answer any further questions you may have. Love's Labradors puppies strives for the best caring and most loving homes for their puppies. We seek adopted homes to have a fenced yard, be responsible home owners, be past Labrador Retriever owners or raised a puppy of some breed and the care they are going to give this new 4 legged Angel on Earth is beyond what others would call Heaven on Earth. I care for these kids and want the love and caring to continue to the level I would care and love them and even more. I have never pushed my Labrador Retriever Puppies to competitors, as I wish for them to be loved on more than anything. Love's Labradors is not a breeder for the field trialer or the show ring. We invite you to view the litter table on the litter tab to view our 11 litters a year of black, yellow, fox red and chocolate puppies. Based on this alone, why would you put your trust with another breeder? On Monday, December 21st, the world lost a gift from God. Grace showed the personality and love that God wants us to know and experience. Unfortunately, she could not handle the chemo. Now, the little guy couldn't be more handsome, affectionate and incredibly smart. He is now 12 weeks old, arrived 5 days ago and we do not kid you that he is already house trained! He goes to our back deck door and sits patiently for us to open the door and then he goes down the 12 steps, does his business and runs right back up. He learned to go up and down stairs, get house and crate trained in less then a week!